As businesses increasingly rely on IT networks, network management and monitoring is gaining importance. Even a free network management solution such as PRTG Network Monitor helps you to keep track of your network devices and used bandwidth. The network monitoring software checks the availability and performance of servers, workstations, databases, network printers, etc., and analyzes bandwidth usage. If the tool detects a problem or unusual data, an alarm will be triggered instantly, helping you to take a more proactive approach to networking management. 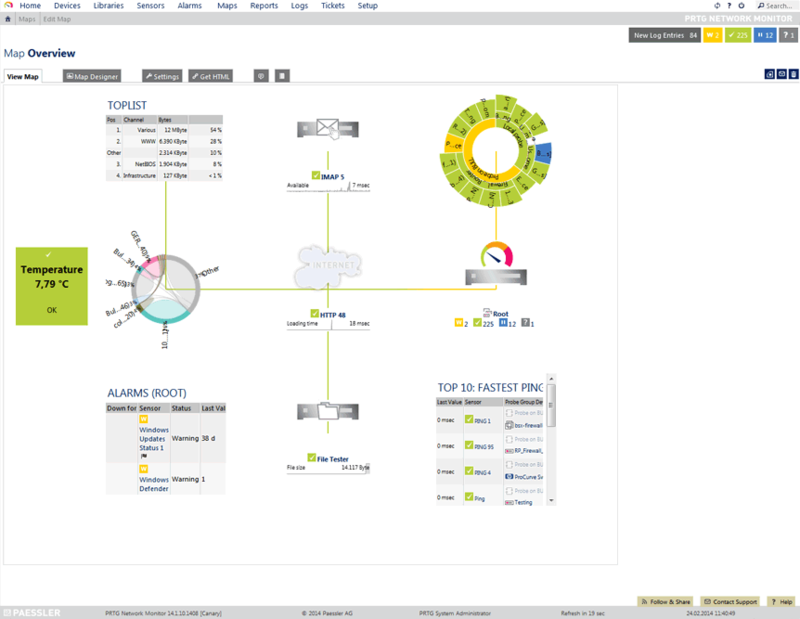 Paessler's Windows network monitoring solution PRTG is available as freeware and commercial edition. Apart from NetFlow sensors, which are only available in the commercial editions, the free version offers the full functionality (protocol analyzer, Windows server monitoring, performance test tools, VMware monitor, VoIP network management, etc. ), but is restricted to 100 sensors. Who Can Use the Freeware Edition? The free network management software is ideal for small companies that want to monitor parameters such as the availability, disk health, and CPU load of their server(s), bandwidth usage, and the availability of a few more devices or websites. It can, of course, also be used for home networks. Need more sensors to monitor a larger IT infrastructure? See our commercial licenses here. A fully functional 30-day trial version with unlimited sensors is available for evaluation purposes.